WS.WebTV: Creating a Theme (Advanced Customization). Instructions on how to create a Theme in WS.WebTV. • Knowledge of file management through FTP, and in general. • HTML + CSS + JS Knowledge (medium/advanced level). 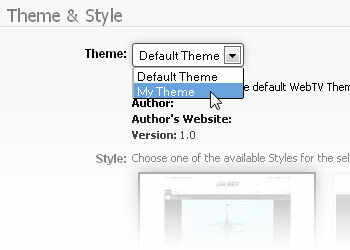 For the example we will create a new Theme based on the "Default" Theme which we will call "My Theme". Please note that it is a JSON, plain text, UTF-8, file. You can use any plain text editor like Notepad, Notepad2, Notepad++, Dreamweaver, etc. to edit it. (...) "id" : The Theme ID which must match the folder name of the Theme. The ID must not contain any special character or spaces. "mobile_support": Options 0/1. Whether your Theme supports the Mobile interface or not (this requires you to supply two versions of each template: one for the "Desktop" and another for the "Mobile" interface). The New Theme will appear in the Configuration > Appearance section of your WebTV. 4. Start editing the new Theme's files! Cache: Disable page caching while editing templates. In order to disable caching go to Configuration > Settings > Caching, and set the "Page cache life" value to 0 (and Save...). Advice: Always keep track of any modification you make to the WebTV so you can re-apply it after updates or reinstallations.